In the descriptions of this book on Goodreads, it states that it has been compared favourably to Wool by Hugh Howie. This is a reasonably accurate description – it does have that feeling of ‘Wool in Space.’ Instead of having people ‘sent for cleaning’ we have them being sent to the planet Soren, a likely death sentence. Yet the comparison is an interesting one not so much because of the content of the book but for the way it was conceived. Just like Wool, the book opens with what’s effectively a short story, and with the exception of one character, none of the others from it recur, or even get mentioned again. 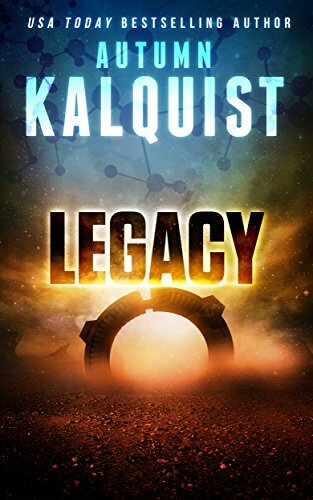 (For the record: I’m aware that Legacy is a collection of republished shorter works – stories that developed into a more conventional novel structure.) It’s the same ‘hook the reader with this world and then develop it further down the timeline’ model, plugged into post apocalyptic dystopia with a space setting. It did make me feel like I was reading a bestseller dressed in another author’s clothing, or a ‘write to market’ book as it’s known amongst authors. There is a familiar drawing on the usual tropes as if it’s designed for the same people who read books like Wool. Yet I feel like I can’t criticise too much for this, because first of all it isn’t a rip-off book. Second of all, it’s very very readable. As spoiler free as I can then: this is a book for anyone who likes a tragedy. It does feel a little bit paint-by-numbers in how the plot’s constructed, and it’s thin on character development until the introduction of Tadeo Raines – my favourite character, caught between loyalties and unsure of to whom he should do his duty, and capable of being the hero but equally perhaps a little dishonourable and possessed of the kind of killer instinct more suited to an anti-hero, but therein lay my interest. Autumn Kalquist is an author capable of delivering surprises by being ruthless with dispatching characters a la George RR Martin, or perhaps Hugh Howie, just to continue a theme. The world these people populate has its own little quirks, carefully thought out, and the conspiracies that unfold within it are enough to make most people turn pages for half the night so they get to the bottom of them. Just like Wool, I feel interested in the sequel in the hope that I might see the mysteries solved, and find out more about how the current setup came to be. It would have been nice to have seen more of a link between the initial short story opening and the rest of the plot (specifically, there was one colonist whose fate I was interested in, yet this character was never mentioned again, and I had the feeling they should have gone down in history for something, rather than being forgotten). It does feel a little predictable at times, yet the surprises are good enough to make me wonder if these books can outsmart me, and I look forward to more. Previous Previous post: Dear Reader, stop behaving!